A hard money mortgage loan is different from a mortgage because it is considered a "high risk" loan. It is secured against a parcel of land typically in a distressed position, such as a parcel in foreclosure or in a short sale position. The hard money loan will also have a lower loan to value ratio than an average mortgage, which may run up to 90 percent of the value of a home. A hard money loan is typically only 60 to 70 percent of the value of the property. Defaulting on a hard money loan can bring detrimental financial consequences. With both a mortgage and a hard money loan, if you default on the loan, you will lose the asset placed as collateral. You should receive multiple notices of delinquency prior to receiving a notice of default. You will be given the opportunity to respond, but hard money lenders are not as lenient as traditional mortgage lenders. 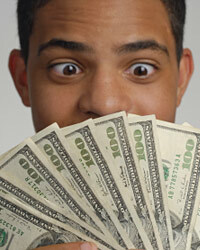 Hard money loans are typically offered by independent financiers or high risk lenders. These individuals set lower credit requirements on the loan, allowing bad credit borrowers a shot at owning a property. In return, these lenders assess high fees and act aggressively in the case of default. They will be less interested in allowing you the chance to restore the loan than a mortgage lender would be. The main reason a hard money lender will act quickly is because they have less to lose by foreclosing. You placed a down payment of 30 to 40 percent on the loan. This money was forfeited to the lender at the beginning of the loan. You will not recover this amount if the lender sells your home in a foreclosure. Therefore, the lender only has to sell the property for 60 or 70 percent of its actual value in order to recover in full. A bank would have to sell the property for 80 or 90 percent of its value, plus any losses due to time spent trying to sell the home. The bank would prefer you to restore your mortgage, but a hard money lender will capitalize on your default. Most people taking hard money loans do so because they do not qualify for a traditional mortgage. This means these borrowers have low credit to begin with. Many have suffered foreclosure or bankruptcy in the past. If this describes your situation, defaulting on this loan could be detrimental to your credit in the future. A second default on a mortgage will essentially disqualify you from the ability to secure any mortgage, hard money or traditional, again in the future. You may even have a hard time getting a minor loan on a credit card or for the purchase of an automobile. Individuals in this situation often have to resort to a "cash only" lifestyle, saving their own income every time they wish to make a large purchase. This can severely limit your ability to build equity in your lifetime.